This range of Ceiling-Mounted loudspeakers, intended for use in potentially explosive atmospheres, has a power rating of up to 8 Watts (upon request) and is suitable for use in the harsh environmental conditions found offshore and onshore in the oil, gas and petrochemical industries. The lightweight, patented design provides self-supporting and self-locking mounting onto a ceiling tile from 0.5 to 55mm thick. 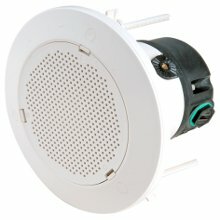 The speaker is held in the mount via a twist-fit support and locking grille, giving access from above or below and allowing first fit of either ceiling or speakers. The DB20C’s compact design will fit a ceiling cavity of limited space and its aesthetically pleasing appearance will enhance the surroundings. 8 x 2.5mm2 optional ATEX and IECEx only.